Take a look through some of our most recent projects below and get in touch with us today to learn more about our many tree services. Our experienced climbers can get up into the tree canopies to property trim branches. Crape Myrtles are beautiful and hardy trees when cared for properly; topping Crape Myrtles is a bad practice and not recommended. Our crews haul away all brush after trimming, or chip the material on-site. When trimming trees over structures, larger limbs need to be tied off so they do not damage the roof or the structure itself. We work with crews of different sizes to make sure that every job is done safely, quickly, and efficiently. Texas Tree Surgeons has the best crews in town; we are honored to work with such a skilled and caring group of people! When a tree or large limb is being removed, it is roped off and lowered to the ground so nothing is damaged in the process. Our work is done by trained tree climbers with specialized equipment. Trimming and removing trees in small spaces takes extra time and extra care. Each piece must be cut and lowered with exact precision to avoid damage to property. Texas Tree Surgeons uses highly skilled climbers who know how to rope off tree parts when removing large trees. Large removals take highly skilled teams of climbers and groundsmen who are experienced in technical tree work. 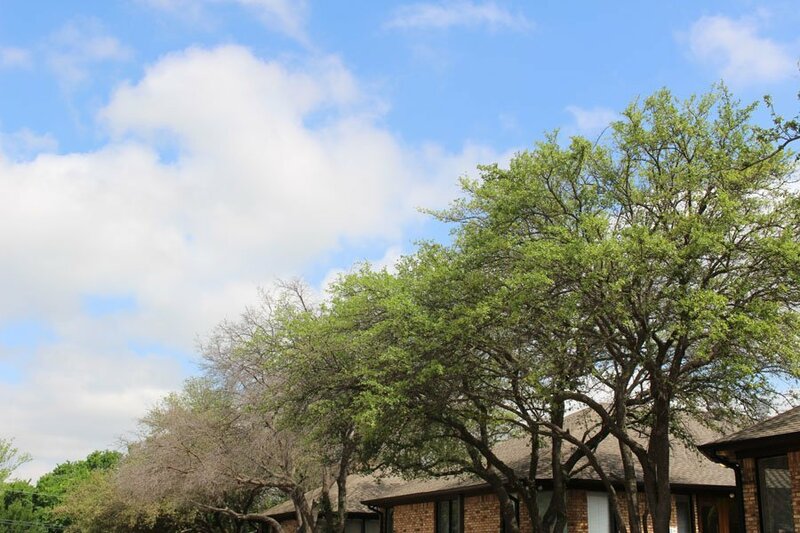 Texas Tree Surgeons is insured and bonded for your protection. Mulch left after stump grinding can be a mess but it can also be useful. You can mix it into your flower beds and pots, use it to backfill the hole created by the grinding, or compost it. Using ropes designed especially for tree care is important. These ropes must be able to withstand the friction against the tree and hold hundreds of pounds. Ganoderma is a fungus that attacks most tree species. It appears as a white or colored rot and can cause trees to become unstable. You never know what is going on inside the trunk of a tree; that is why it is important to have your trees evaluated by a Certified Arborist. Having a tree inspected by a Certified Arborist with a Tree Risk Assessment Qualification can help you understand the risk associated with certain tree defects. Dead limbs should be removed for safety and the health of the tree. This Red Oak tree was split in a wind storm and was cabled and braced by Texas Tree Surgeons. When installed properly, cables reduce both movement in the canopy and pressure on weak areas in the tree. Signs of construction damage can take years to appear in the canopy of the tree; this pattern of dieback is a common sign of construction stress. Live Oaks with Oak Wilt can develop signs slowly and preventative treatment can be effective. Once signs are appearing in the canopy of the tree, treatment is more challenging. Oak Wilt is a devastating disease and is becoming more of an issue in North Texas; this photo is of Oak Wilt in Richardson, TX. Make sure you are using a company with Oak Wilt Qualified arborists. Trees with light green leaves are often suffering from a lack of necessary nutrients; this is a sweet gum suffering from Iron Chlorosis.